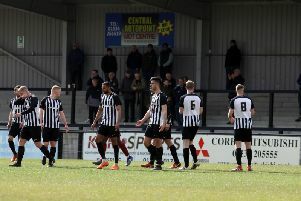 Tommy Wright delivered an astonishing assessment of Corby Town’s 1-1 draw at Gainsborough Trinity when he admitted he was “a bit bored” by the clash. The Steelmen bounced back from their first defeat of the season by earning a point in Lincolnshire as Greg Mills’ second-half penalty ensured they remain unbeaten on the road in the Vanarama National League North. But boss Wright was far from happy with the display his team produced. And he insisted that was down to his decision to change the shape in a bid to cut out the defensive errors that cost them in the 3-1 defeat to Solihull Moors last Monday. “We didn’t play well,” the Steelmen manager said. “We changed the shape simply because we have been conceding too many goals but, to be honest, it resulted in a game I didn’t enjoy watching. “I was a bit bored to be honest. Until I changed the shape again we were lacking in the attacking areas. We didn’t have that wide and expansive look to us. “Throughout last season we received praise from our supporters for the way we played in matches and that’s what I want to hear from them. I want us to entertain them. “The game itself wasn’t great. They could have won it, we could have won but in the end the result was about right. “I am not that interested in going out and playing for points and play for draws or anything like that. I am going to go straight back to our usual style and I am going to stick with it. “We’ll win some, we’ll lose some but at least we will be doing what we do best. The Steelmen are back on the road next weekend when they head to FC United of Manchester.